MANHATTAN — As school starts up again, many families are organizing their homes in order to carve out a place where their kids can do their homework. Parents in tiny apartments sometimes worry their kids won't have ample space, but it's easy to create something appropriate and appealing with limited real estate, said Maxwell Ryan, founder of the popular design site Apartment Therapy. "Children don't need a big space," Ryan said. "They like cozier smaller spaces in general." In his eight years as an elementary school teacher at an Upper East Side Waldorf school, Ryan learned a lot about design, most notably that "the room is as important as the lesson." He put this into practice when creating the workspace for his 7-year-old Ursula, who is now starting second grade. 1. Turn a nook into a work spot. If a child's bedroom is too small for a desk, opt for quiet nooks nearby, Ryan suggested. Since his daughter's room only fits her bed and dresser, he built a desk using an inexpensive Ikea countertop that he painted red and cut to fit the space between her bedroom and living room, adding three legs to it. "It's a nice wide surface," he said. "I have a nice lamp there and a shelf above." 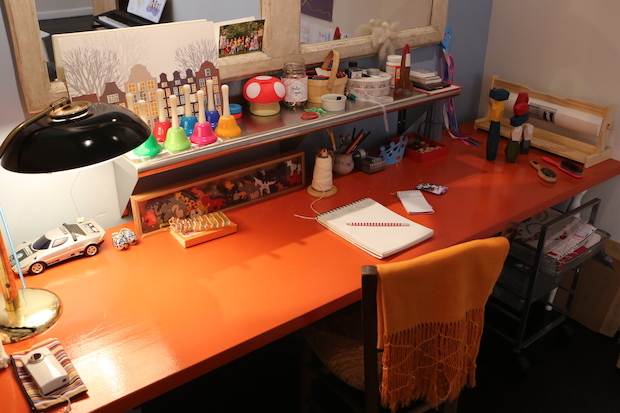 Making something custom often works better than buying a desk, he said, especially for quirky spaces. "An empty closet, a space underneath the stairs or any one of those infuriating spaces you thought you could never use in your apartment can be easily transformed into a special spot for your kids to call their own," said Brooke Stone, whose personal assistant concierge company GYST helps families organize their spaces. She suggested the desk face a wall to minimize visual distractions. All you need to start with is paper, pens, markers and a few other supplies, along with a good chair and a clean, clear surface, said Maeve Richmond, founder of the New York City-based Maeve's Method, a do-it-yourself home organizing company. "Kids need just a few simple things to help keep them grounded when headed off to school," said Richmond, who was a student teacher at The Children's School in Stamford, Connecticut. As they bring artwork, schoolwork, books and projects home, children need a space to get things done, but organizing experts agree that it helps to avoid overstocking the workspace or providing too much storage space that will eventually get filled and become hard to clean. "This creates more visual clutter for your children and makes everything else harder to find," Stone said. For her fifth and third-graders who do their homework at the kitchen table, Leticia Barr — a D.C.-based former elementary school teacher who writes the Tech Savvy Mama website, which has a big New York City following — has a basket of supplies that comes out when they're working. "Our routine is: They come home, sit at the kitchen table and have a snack and do their homework," she said. "Then they're free to do other things." Enlist your children in the process of where things live, Stone suggested, in order to help them feel more responsible for things getting back to their proper places at the end of the day. "Label contents of drawers and bins clearly in a way they will understand," she said. "If your children are younger and not yet reading easily, draw representative pictures on the labels instead of using words." 4. Make the space special. Skip manufactured art for your kids' masterpieces, advised Ryan. "Anything a child [draws by hand] is far better for their walls than something machine made," he said. "A child is learning how to make the world their own. When you give them something that's already processed, they don't have to digest anything." Give them ownership over the space by letting them pick out the "perfect pencil cup," a special lamp or ruler in their favorite color, Stone said. "If you take the time to make their space special and inviting, they will want to go to their workspace and do their work that much more," she said. For younger kids who aren't yet doing homework on computers, try to limit the electronics that surround them in their workspace to keep things "calm and peaceful," Ryan suggested. Barr's children often have computer-based assignments, and she prefers that they use a desktop computer that is centrally located in the kitchen and generally not used for recreation. "I like the larger monitor because it prevents eye strain for kids," she said. "Being able to see the screen allows you to help them if they get stuck and when kids are really young, it's good to keep an eye on what they're doing, especially since there are so many blinking, weird pop-ups that flash on-screen they might want to click on." 6. Get a cubby space. Especially if you have multiple kids, it's helpful to have a cubby space at home like the one they may have at school, ideally in the front hall, said Richmond. This is where kids can put their things, like sports equipment and bags, which are unrelated to schoolwork. The cubby gives kids a sense of their own space and reduces distractions around the homework area, so "things are not dropped into the middle of the floor, trailing into the house," she said.